Why does God allow evil and misfortune to exist? Jesus healed people, but why did they have to suffer in the first place? 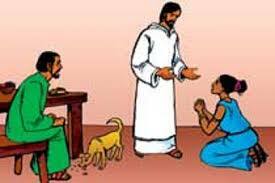 In today’s two Gospel stories Jesus heals a Syrophoenician woman’s daughter and a deaf-mute man. But these accounts raise the question of why these people needed to be cured in the first place. Why would an almighty and all-loving God require them to suffer? Why does God allow bad things to happen to good people, or even allow evil to exist at all? Theodicy is the technical word for trying to find an adequate explanation of this dilemma. The world of ancient Israel had a simple response to this problem. Sin had taken place, so God had to punish someone. It didn’t need to be the sinner him- or herself. 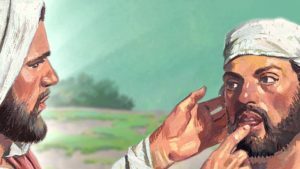 In Torah Judaism, God “visits the fathers’ sins on the children to the third and the fourth generation …” The sinner in the first case might have been the Syrophoenician woman herself or her sick daughter. In the second, maybe it was the deaf-mute man or his parents or his siblings. Or the sin could have taken place further back. In this explanation, the Law of Moses presents God as judgemental and even vengeful. That view was largely discarded by later Biblical authors. Jesus illustrated this new perception when he encountered a man born blind [John 9: 2-3]. 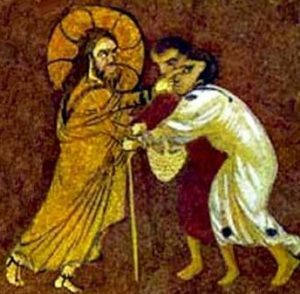 The disciples asked, “Who sinned, this man or his parents, that he was born blind?” Jesus replied, “Neither this man nor his parents sinned; he was born blind so that God’s works might be revealed in him.” That answer seems to imply that God had deliberately caused the man’s blindness. That allowed Jesus to perform a healing miracle to testify to his divinity. I would be more comfortable with saying that although the healing miracle attested to Jesus’ divinity, the text does not spell out why the man was born blind. Scripture gives us a version of my comment. ‘God sends his rain on the just and the unjust’ [Matthew 5:45]. That is, Jesus comments that rain is beneficent; it falls on the fields of both virtuous and evil farmers. Cancer can be described as a natural evil. Mary-Lou’s cancer was the luck of the draw, like whether your house was destroyed or spared in a tornado. Maybe she inherited a defective gene; maybe she was exposed to an environmental pollutant. We will never know. But we human beings try hard to reject bad luck as the reason for our misfortunes. We feel intuitively that there must have been a reason. We could find that reason if we only looked hard enough. But that is exactly the style of thinking that the ancients used when they postulated sin as the cause of misfortune. It is ultimately a losing game; there is no answer. Other bad luck is the result of human actions like war or murder. These can be called moral evils. Back in June, two little girls were shot and injured while playing in a Toronto park. They were the innocent but unlucky victims of a shooting that missed its intended target. There were eleven children in the park at the time. Why were these two sisters injured? Why them specifically, and not any of the other nine children? Again, it was bad luck. They were in the wrong place at the wrong time. Theodicy – how can I retain my faith in God in the face of evil and random bad luck? But if God isn’t an almighty Mr. Fix-it, wouldn’t random bad luck cause us to lose our faith in God? I paid up my insurance policy by going to church and praying regularly. Why didn’t God pay out on the policy? But theodicy does not attempt to defend God against the charge, “Why do you let bad things happen?” It tries to show that it is reasonable to believe in God despite the evidence of both natural and moral evil in the world. Dualistic religions such as gnosticism sweep this problem under the carpet by positing two gods. An evil god operates in this world, opposing the actions of the one true god who operates on a heavenly, spiritual plane. Even if God allows natural disasters, surely God should step in to avoid moral evils? My near-favourite author Pelagius wrote that even our ability to choose evil is a sign of divine goodness; it shows that God gave us free will. The mythic story of the fall of Adam and Eve [Genesis 3] gives us a remarkably good take on free will, and the Torah’s insistence that sin must be punished (see earlier). God had told the curious and intelligent people he had created that they could eat the fruits of any tree, except for the tree of the knowledge of good and evil. Could God really have believed that they could resist? Not likely! Adam and Eve were banished from the immortal and perfect garden because they chose to eat the forbidden fruit. Now that they knew the difference between good and evil, they could no longer live the perfect life in the perfect garden. They and their descendants (us) have to live in our slightly imperfect yet still wonderful world. In a piece of Scripture that we usually read in Advent, the prophet Isaiah wrote of a glorious new creation. There would be no more weeping or distress, and no untimely death. Everyone would live to a ripe old age [Isaiah 65: 17-20]. It was a nice dream, but it cannot become reality because it is predicated on God micro-managing a perfect world. In reality, we blunder about our slightly imperfect world, using our free will to make choices that are sometimes good and sometimes bad. Indeed, our existence would be completely sterile if we were all forced to conform robotically to what was pre-planned for us, as in Aldous Huxley’s novel Brave New World. The picture is completed by our reading from the Epistle of James, who tells us famously that faith without works is dead. James then put this argument. If someone says ‘You have faith and I have works,’ it follows that my works are explicit evidence of my faith (or lack of faith!). That is the essence of Jesus’ statement in the Sermon on the Mount, “By their fruits you will know them” [Matthew 7: 20]. Jesus compared a good and a bad tree. James spoke directly about people and their works instead of using the metaphor of trees and their fruits. The psalms of lament, and especially Psalm 73, illustrate vividly the dilemma that humans face in confronting evil and injustice. At the beginning, the psalmist admitted that [he] had almost lost his spiritual footing. He was grieved because wicked people seemed to get all the good fortune, even though they treated other people unfairly. Why did God let this happen? Yet eventually, he went into God’s house, and considered the fate of the wicked. He realized that any punishment they might deserve had to happen in God’s time, not his own. His role was to trust in God, not to be God, dishing out retribution. That, to sum up, is also the essence of Psalm 23, The Lord’s my shepherd. God does not offer insurance policies that nothing bad will happen to the faithful. Rather, God walks with us in the good times and comforts us when we must walk through the dark valleys of life. It’s not a perfect explanation, but it is theodicy – an answer as to why we might trust in God even in the face of evil and unfairness. You can read more in the book ‘ When bad things happen to good people’ by Rabbi Harold Kushner. It was first published 1981, but is just as relevant today.